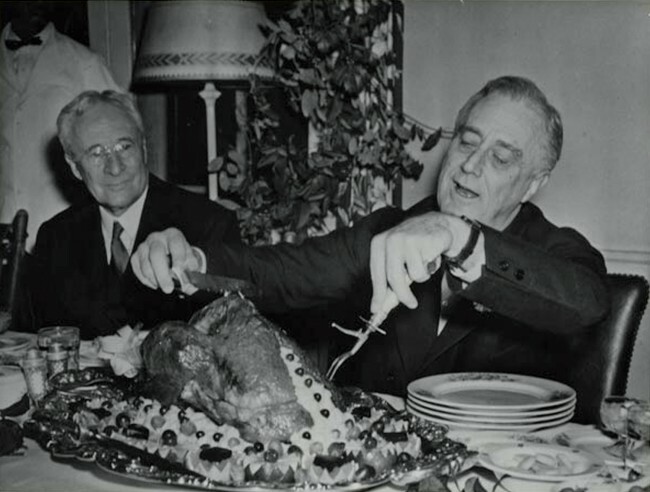 President Franklin D. Roosevelt Carving the Thanksgiving Turkey, November 30, 1933. I, Franklin D. Roosevelt, President of the United States of America, do hereby designate Thursday, the twenty-third of November, 1939, as a day of general thanksgiving. More than. three centuries ago at the season of the gathering in of the harvest, the Pilgrims humbly paused in their work and gave thanks to God for the preservation of their community and for the abundant yield of the soil. A century and a half later, after the new Nation had been formed, and the charter of government, the Constitution of the Republic, had received the assent of the States, President Washington and his successors invited the people of the Nation to lay down their tasks one day in the year and give thanks for the blessings that had been granted them by Divine Providence. It is fitting that we should continue this hallowed custom and select a day in 1939 to be dedicated to reverent thoughts of thanksgiving. Let us, on the day set aside for this purpose, give thanks to the Ruler of the Universe for the strength which He has vouchsafed us to carry on our daily labors and for the hope that lives within us of the coming of a day when peace and the productive activities of peace shall reign on every continent.